A propane tank requires a regulator. The propane regulator is just as important, if not more, as the propane system in your recreational vehicle. The entire apparatus is tasked with making the ambiance comfortable for all occupants. The propane tank also serves other purposes including but not limited to power appliances. Propane or liquefied petroleum gas is flammable and hence the job of the RV propane regulator is extremely significant. It is integral to your safety and the recreational vehicle itself including every installation inside and outside. Propane powers appliances and heats water for a hot shower. Propane heats water for dishwashing and other purposes. It keeps the indoors warm and cozy. The propane regulator is an integral part of the entire system. There are two types of propane regulators. There are variants but the two categories are the broad and primary classification. An RV propane regulator controls the pressure in two distinct stages. One stage reduces the pressure down to ten or at the most fifteen pounds per square inch. The pressure is much higher inside the propane tank, usually two hundred and fifty pounds per square inch if not more. The other stage regulates the flow of propane through the system. This is usually regulated at around eleven water column inches. This is the standard flow of propane in recreational vehicles, especially for appliances. To facilitate the two stages of regulation, an RV propane regulator has one component segregating the tank from the entire system. An RV propane regulator assures safety and also ensures the appliances work as they should. A malfunctioning regulator will make your recreational vehicle unsafe. An issue with the regulator will make the ambiance uncomfortable. Glitches will render your appliances ineffective. The appliances will not function if the pressure is not optimally regulated and this is regardless of how much propane you have in the tank. 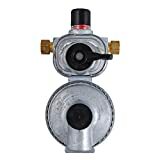 Despite the significant role of an RV propane regulator, it does not cost much and you can get durable, reliable and efficient models priced at around thirty bucks. You may pay less if there is a discount. An RV propane regulator does not require professional installation. You do not need many tools, albeit the components are necessary to complete the installation. You should know that some manufacturers do not provide the screws and other components that are needed to install the regulator. You may have to buy them separately. Some manufacturers include everything in the box. If you are unsure of the installation process and do not wish to test the waters, you can hire a professional or you can get someone who knows to simply plug the device in. The whole process is quite simple. You should get familiar with the various features of an RV propane regulator. The device is not complicated so getting accustomed to the inlet & outlet, the vents, and the docking mechanism will be sufficient. An RV propane regulator should be covered. You can get plastic covers specifically designed and made for such regulators. Many new recreational vehicles have the cover. Older models do not always have it so you must buy one. Buy a new cover. Do not use a damaged or cracked cover. It is necessary to accept the reality that an RV propane regulator will not last a lifetime. Most regulators work well in the first ten years. Some of the better models run well for fifteen years or so. You will have to replace the regulator thereafter. It is possible for a regulator to have issues during the first few years. Some issues can be addressed with timely repairs. A few issues can be averted if you follow the instructions of the manufacturer and do not tamper with the regulator in any unnecessary manner. It is best to replace a malfunctioning regulator that cannot be fixed. Do not continue using one that is having problems. Never compromise on safety. Most people replace an RV propane regulator when it is old enough and starts having some symptoms of wearing out. It is always better to replace an RV propane regulator before it breaks down. An RV propane regulator operates in a simple manner. There is a regulator valve. It should be turned off when you are filling the propane tank. Turn the valve back on when the tank is full. Do not keep the valve turned off after the tank has been filled. If you find the appliances are not working after you have just filled your propane tank, then it is perhaps owing to the regulator valve. People do forget to turn it back on. The technician servicing the tank and filling it up with liquefied petroleum gas can also turn the valve on if you ask. Many recreational vehicles have more than one propane tank. You may have two but you do not need more than one RV propane regulator. You can use an automatic dual tank regulator with a changeover feature. You will be able to use one propane tank at a time. These regulators have a lever. You can use the lever to access the propane in one tank and when it has run out of liquefied petroleum gas you can switch the lever to the other tank and everything will function as they should. Having two propane tanks makes sense since you do not want to run out of gas and hence heat and power in the middle of nowhere. All you have to do is make sure both tanks are filled and the one emptied is filled at the first opportunity you get. It is needless to switch the lever from one tank to another when neither is empty. Some people may want to alternate but it is not necessary. Propane or liquefied petroleum gas is infused with a distinct odor. There may be times when you will smell the odor. The odor is always concealed inside the tank and the hoses or pipes. You should not get to smell it unless there is a leak or an appliance is unable to keep the gas in check while using it or being powered by it. Try to find the source of the gas leak. Shut off the valves, turn off the supply of propane from the tanks, shut down all appliances and also make sure there is no other source of the odor, from cigarettes or a campfire, grills or other methods of cooking and steaming. Find the problem and address it fittingly before you resume using the propane tank, the gas itself or any of the appliances and luxuries powered by liquefied petroleum gas. An RV propane regulator is not always treated as significantly as the recreational vehicle or the tank. It is actually as important as the vehicle, its engine or transmission, the furniture you have inside, the various essential and non-essential components among other fixtures. Stay abreast about safety, functions and timely actions regarding your RV propane regulator. Don't run out of propane gas with this convenient regulator, ideal for RVs with dual propane tanks. Hooks up 2 propane tanks to your RV at once so you'll always have a fuel supply. UFPD has a two-stage RV propane regulator. It comes with two pigtail hoses. It is one of the highest rated regulators for recreational vehicles on Amazon right now. The regulator works with two propane tanks. It has an auto changeover feature. You do not need to switch a lever when one tank is empty and you need to access the second tank. The regulator can detect an empty tank and automatically switch to the full tank for continuous flow of gas and hence functioning of all the connected or powered appliances and features in your recreational vehicle. You can also remove the propane tank or cylinder that has been emptied without removing the regulator and hence interrupting the supply. The box has two twelve inches pigtail hoses. Marshall Excelsior has a two-stage propane regulator for recreational vehicles. The MEGR-253 model is compatible with an inlet pressure of a maximum of two hundred and fifty pounds per square inch. 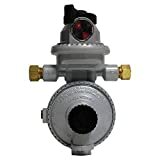 The regulator has a quarter of an inch female inverted flare inlet connection, a three-eighth of an inch female national pipe thread outlet connection and raw zinc powder coated exterior. Marshall Excelsior has another model MEGR-253H with an auto change feature. The model has a full warranty from the manufacturer. 262,500 BTU's Per Hour Capacity. Set at standard propane low pressure - 11" Water Column. Fairview has an RV propane regulator, also for campers, with a capacity of handling over two hundred and sixty thousand British thermal units per hour. The two-stage automatic propane regulator has two fifteen inches QCC Acme pigtails. The standard low pressure of propane is eleven inches water column. Those unfamiliar with the specific method of installation should get a service technician to take care of it. This RV propane regulator can be hooked up with two tanks. It will automatically switch from the empty tank to the one that still has propane without interrupting the supply. The box does not include the mounting screws. Available now from Amazon. Camco has a double or two stage RV propane regulator with auto changeover. This works with two propane tanks and can switch conveniently and timely from the empty tank to the full tank. The regulator is effective at maintaining a constant pressure. Camco sells this RV propane regulator at $40.99. You may get a discount on Amazon, bringing the price down to $31.07. You may save one more buck with an online coupon. You can refill the empty propane tank or cylinder without affecting the operation of the regulator and accessing the gas in the other tank. The box includes an inverted flare inlet and female pipe thread outlet connections. The switchover from primary tank to reserve tank is instantaneous. The capacity handled by the RV propane regulator is two hundred and ten thousand British thermal units per hour for the primary tank and a hundred and thirty thousand British thermal units per hour for the reserve tank. Just as you must be familiar with an RV propane regulator and choose a reliable one, you should be aware of the various parts, fittings, and accessories required for a propane system to be fully functional and efficient. You will need a propane adapter kit or individual components such as the adapter tee, valve and extension hose, assembly hose, pigtail hoses, cylinder or tank adapter, pigtail flares, connector kit with the shutoff valve, nuts and screws, low pressure hose, distribution post, storage bag, plugs, pipe threads, converter and other fittings for appliances. There are many types of fittings used in a propane system. All such fittings have female and male ends. There is no one size that fits all. You must choose appropriate fittings depending on the configuration of the system you have in your recreational vehicle. A standard RV propane regulator will be suitable for all propane systems unless there is something truly unique in your setup. Propane tanks are standardized, regardless of their capacity but you should know about the various types of fittings. For starters, you can read about Type 1 or ACME fitting, POL fitting, Male Disposable Cylinder Port, Female Disposable Cylinder Port, Male Inverted Flare, Female Inverted Flare, Male NPT, Female NPT, Male Quick-Disconnect, Female Quick-Disconnect, and Flare Fitting. These are simple components of the propane system. You should be familiar with these as you will have to buy most of them at some point in time. All these components should be perfectly compatible with the system. Compromising the quality of fittings will make your system unsafe. You will be unable to use most of the incompatible fittings so buying them will be a futile expenditure that you must avoid at all times. Some incompatible fittings may seem to work in a system and you may be oblivious to the fact that the system is not safe with such components. If you are ever in doubt, consult a technician or you can contact the company whose fittings you are purchasing just to be sure that you are choosing the perfectly compatible fitting.